The stock market's panicked reaction to signs of wage growth shows just how weak the economy is — and how much it caters to the wealthy. Stock markets, after stabilizing momentarily, returned yesterday to what the press likes to call “turmoil.” What does it all mean? There’s no doubt that stocks have been due for a comeuppance for some time: they’re very expensive. Since stocks represent claims on corporate profits, present and future, the conventional way to value them is by measuring their price against those underlying profits (or “earnings” in Wall Street lingo, since to the owning class, profits from capital are just like wages for labor: as they like to say, they put their money to work). Ideally they’d be measured against future profits, but no one knows what they are, so the next-best thing to do is measure them against past profits. The standard measure for that is the price/earnings (PE) ratio — the price of a stock (or a stock market index) divided by corporate profits per share (or total profits of the stocks in the index). Since the late nineteenth century, the PE ratio for the broad stock market has averaged sixteen; since 1950, it’s averaged eighteen. It’s now 27. But PEs can be volatile. To adjust for that, Yale economist Robert Shiller invented a longer-term measure, which adjusts profits for inflation and measures current prices against their ten-year trailing average. The century-plus average is seventeen; since 1950, it’s nineteen. It’s now thirty-three. As the graph below shows, Shiller’s PE is higher today than it was at any point in a history that begins in 1881, except for the climax of the late 1990s bubble. It was lower in 1929 than it is today. Another valuation technique is comparing the value of all stocks outstanding to GDP. That is now only a hair below its 2000 peak. And what about profits? Profits recovered far more quickly and dramatically than wages after the end of the Great Recession. In the first three years after that miserable event came to a formal close (2009–2012), corporate profits after taxes rose 55 percent. Meanwhile, what corporations paid their employees rose just 12 percent. Stocks became quite rationally exuberant, celebrating the increase in profits and its likely continuation. Over those three years, stocks (measured by the S&P 500) rose 85 percent, taking them close to where they were before the financial crisis hit. The momentum in profit growth slowed (and that in wages and salaries picked up), but that didn’t stop stocks from rising further, surpassing the 2007 high in 2013, and then adding another 56 percent through the election of Trump. All that despite the fact that, as the graph below shows, corporate profitability peaked between 2012 and 2014 and has been edging down since. Stocks paused for a week or so after the election as traders sussed out what this unexpected turn of events might mean, but it soon became clear that whatever his idiosyncrasies, Trump meant tax cuts and deregulation. So it was back to the races. Stocks added another 29 percent between November 2016 and January 2018, taking us to the extreme valuations described above. Rational exuberance was succeeded by the less rational kind. When people say the economy is strong, they mean that unemployment is low and we’re adding 180,000 jobs a month. But millions have dropped out of the labor force. If the same share of the population were working now as at the 2006 pre-recession peak, 8.4 million more would be employed. 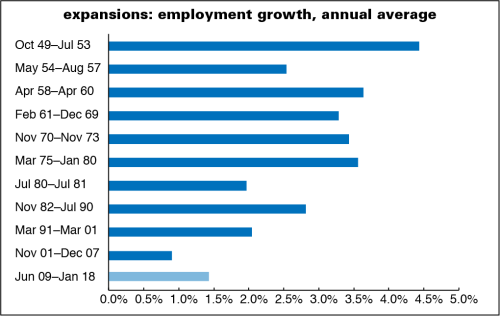 As the graph below shows, this is the second-worst expansion for job growth out of eleven. 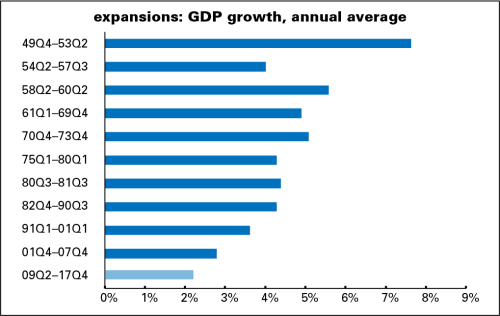 And by the most conventional measure of all, GDP growth, this is the slowest expansion since quarterly GDP stats begin in 1947. It’s now the fourth expansion in a row to be slower than its predecessor. Though the 1970s are mocked as a time of economic misery, growth was twice as fast between 1975 and 1980 as it has been since 2009. Another standard measure of the strength of an economy is the growth in productivity — the value of output per hour of labor. It is quite weak, hovering close to zero. The politics of productivity are complicated. Productivity can be boosted through speedup and other forms of brutalizing labor. And productivity gains could all be captured by bosses in the form of higher profits and not by workers in the form of higher wages. But slow productivity growth puts a lid on income growth over time, and by the most orthodox of standards is a sign of a sickly loss of economic dynamism. A major reason productivity growth is so weak is that corporations have been stuffing their shareholders’ pockets with cash rather than investing it in buildings and equipment. Since 2012, non-financial corporations have made net investments — net meaning after allowing for the depreciation of existing assets — of $2 trillion. Over the same period, they distributed $6 trillion to shareholders in the form of dividends, stock buybacks (intended to boost share prices), and takeovers. Instead of providing investment funds to businesses (which is what most people think it does, but it really doesn’t, and never has very much), the stock market has served as an instrument of value extraction for the last thirty-five years. It’s as if the owning class has given up on the future and just wants to load up on private jets and Roederer Cristal. In that sense, the current administration, which is full of asset-strippers, starting with Trump, is the perfect representation of this version of capitalism. The spark for the selloff came from last Friday’s monthly employment report, which showed a pickup in wage growth in January. (As this post shows, the pickup all came from upper-tier workers; the bottom 80 percent didn’t participate.) This was read as a sign of inflationary pressures that would drive the Federal Reserve to push up interest rates more aggressively than they might have otherwise. Higher rates are generally bad for stock prices and make it more expensive to be a professional speculator operating on borrowed money. Through the Great Recession and its aftermath, there’s been more worry about deflation than inflation, and the normally inflation-averse Fed was looking for a bit more of it as insurance against a deflationary spiral. But as the unemployment rate kept falling, alarm about a tightening labor market — when the labor market is tight, not only can wages rise, but workers can develop an attitude problem — fueled increasing fears of incipient inflation. That inflation never really arrived — until, in a lot of eyes, that January spike in wage growth. Of course, one month’s numbers don’t mean all that much, but a lot of market players were just looking to be spooked. It’s not only rising interest rates that are worrisome. To fight the 2008 financial crisis, the Fed and its central bank comrades around the world drove interest rates to record-low levels and promised to keep them there for a long time. But in addition to that they injected vast gobs of money into the financial system, a process called quantitative easing (QE). It did, however, stimulate the financial markets mightily. Aside from providing money managers more cash to play with, the Fed’s guarantee that interest rates would stay very low sent investors searching for higher yields, great news for riskier assets like stocks (and more exotic assets like Silicon Valley startups). This is all now going into reverse. The Fed is allowing the bonds it bought to mature and isn’t buying new ones; its assets have been declining slowly. It’s not sucking money out of the markets, but it’s not pumping in a trillion a year anymore, either. And the likely trajectory for interest rates is modestly higher this year and beyond. Markets love easy money (as long as workers aren’t getting a piece of the action), and they were always going to have to get used to harder money. The wage spike made it seem like money was going to get harder more quickly than they’d thought. How much does this matter? It’s quite possible the market could recover. 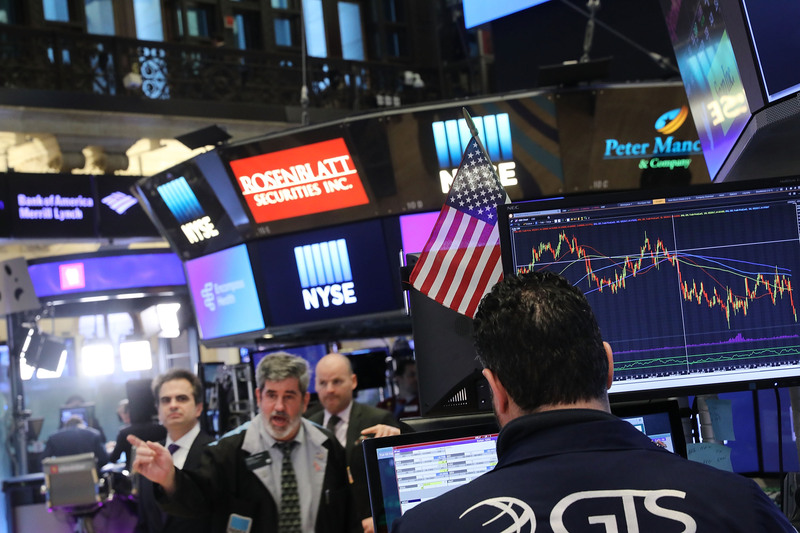 The selloff was intensified by algorithm-driven trading; that could turn around. But at some point high valuations will revert to the mean, or worse, and that is often not a calm process. Higher interest rates breed bear markets and, eventually, recessions. For most people, the direct, immediate effects of the stock selloff are minor. Though Trump kept urging people to check their 401(k)s for proof of his excellence, only half (52 percent) of the population has a retirement account, and of those that hold one, its median value is $60,000. 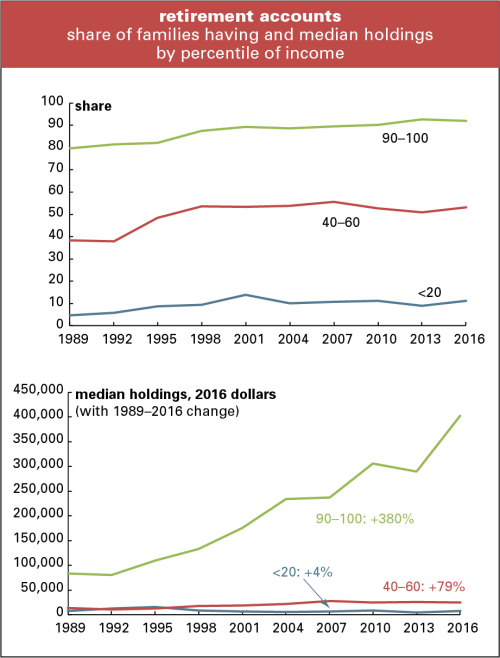 More broadly, only about half the population (51 percent) owns stock, either directly or through a mutual fund; the median holding is $40,000. People in the middle of the income distribution own $15,000 worth of stock. As the graphs below show, even retirement accounts, which are supposed to be more “democratic” than the stockholdings of the rich, skew massively upwards. Among the richest tenth, 92 percent have retirement accounts; among the poorest fifth, just 11 percent do. The top tier’s median holding is $403,000, up 380 percent from 1989; the bottom’s, is $7,800, up 4 percent. But a stock market crash can do damage if it’s deep enough, or if it’s a symptom of problems in the credit system. The market tanked during the 2008 financial crisis, but the reason that we lost almost nine million jobs during the recession was the implosion of the credit system. 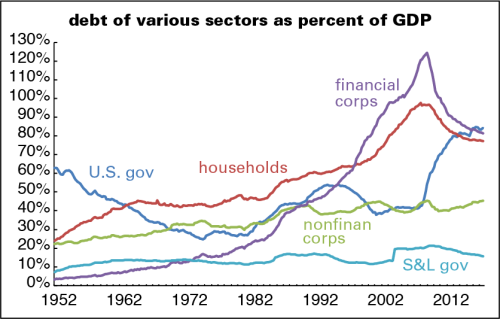 Banks wouldn’t lend and even solvent individuals and businesses didn’t want to spend, much less borrow. The driving force of the crisis was the unwinding of the mortgage boom, made worse by all the clever financial products it spawned. Things don’t seem so dire now (though you never know). No doubt there are some stink bombs hidden in the financial system — derivatives we won’t understand until months after they blow up, say — but overall the credit system doesn’t look as vulnerable to a total meltdown as it did then. But what hasn’t happened is the emergence of a new model for the economy. With the Reagan years came a war on labor — the busting of unions, the repression of wages, the war on our meager welfare state — a war whose gains were consolidated in the Clinton years, as the Democratic party was turned into a pure business party. With household incomes under pressure, people used credit cards and mortgages to fund the semblance of a middle-class standard of living. The financial crisis busted that model apart. Household incomes are still under pressure, but money has been far less easy for the middle and lower ranks than it has been for the upper. Slow growth and popular rage are the result. When stocks were falling hard, left social media lit up with predictions (laced with hope) that this was It — It being the crisis that was finally going to wake people up and foment rebellion. That’s not the way things usually work. The US got more civilized in the 1930s thanks to the New Deal, but you can’t say that about Germany. Crises often drive people to the right not to the left. I don’t think a rerun of the 2008 meltdown is in the cards. But whether you measure by conventional indicators, like GDP and productivity growth, or more humane ones, like the capacity to deliver a decent and stable standard of living to people with less than six-figure incomes, this economy is anything but strong. Signs of wage increases should not be occasions for panic, but when the economy is organized around the needs of the top 10 percent, they are.